A Notary Signing Agent (NSA) is a Notary Public who is specially trained to handle and notarize real estate transactions and mortgage loan documents. For lenders, Notary Signing Agents are the critical final link to complete the loan. A Notary Signing Agent is hired as an independent contractor to ensure that real estate documents are executed by the borrower, notarized, and returned for processing on time. Completing this critical part of the mortgage process enables the loan to be funded. An NSA oversees the signing of documents for the following real estate transactions: Purchase (Mortgages & Cash Deals), Refinance, Commercial & Construction Loans, and Reverse Mortgages. Our Notary Signing Agents are certified through the National Notary Association (NNA), and work exclusively with Title/Escrow companies. Some lenders may provide you with a similar or longer list of approved items. Bring proper identification with you to your closing, you'll need two forms - one Primary ID and one Secondary ID (see list above). 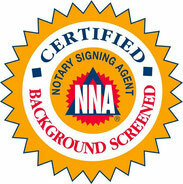 It is the notary signing agent's responsibility to properly identify each signer, and to verify each ID. An expired ID is not acceptable. Sign all documents exactly the way you see your name printed. If your name is printed as First name Middle initial Last name (ex: John H. Smith), then you must sign in such a way that you can see a first name, a middle initial, and a last name. The popular "letter with a squiggly line" type of signature isn't allowed in this case. You basically are signing in script/cursive, which is legible. So if you're not use to signing your name in this manner, then practice writing your signature a few times in this way before going to your loan closing. The more legible your signature, the less potential for a delay in processing. Also, use the pen that the notary signing agent provides you, as many title companies are picky with the color ink used. Review your Closing Disclosure (contains the loan terms, fees & expenses) thoroughly before you arrive to the closing table. You should receive a copy of this document at least 3 days prior to your closing. During that time you should look to identify any issues on the CD, and to clear them up with your loan officer. When the notary signing agent reviews the CD with you during the closing, it should be all "old news" and no surprises. The better your understanding of the terms on your CD, the faster the closing will be. Just say "Send Mike Malleo!" not permitted to give any legal advice, nor any opinions / recommendations on loan terms or conditions. All legal and mortgage-related questions must be directed to your real estate attorney or mortgage loan officer.